You can receive the Village’s newsletter and important notifications by email by simply clicking here and completing the form. Below is a sample from a recent newsletter. 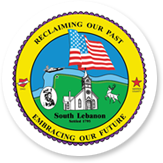 If you have any questions, feel free to contact the Village at jhaddix@southlebanonohio.org.